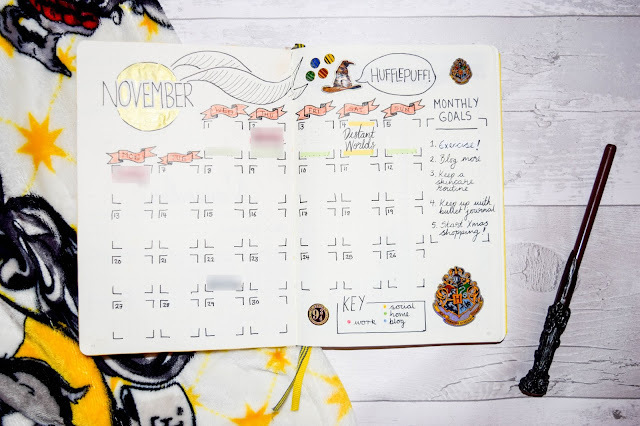 I'm really enjoying my bullet journal and even more so that I meet up every month to do it with my bestie and blogger Ana. 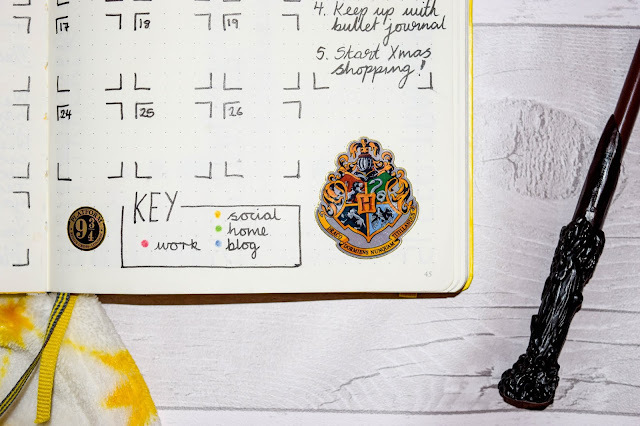 This month, I wanted to go all out Hogwarts Houses after I bought some stickers from the Platform 9 & 3 Quarters Shop at King's Cross Station last month. This month's pages look quite different to what I've done before but I think they're my favourite pages yet! 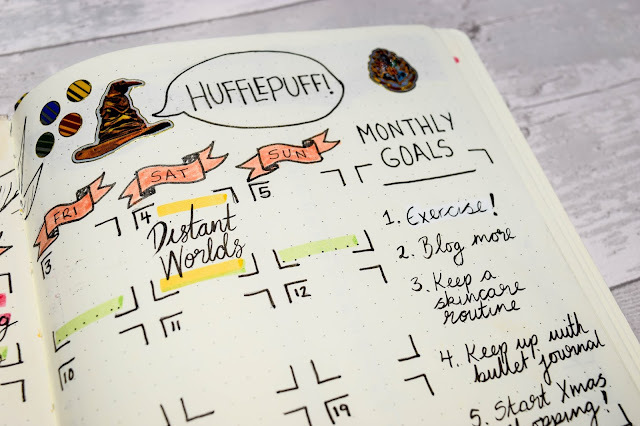 This month, the theme was Hogwarts Houses. 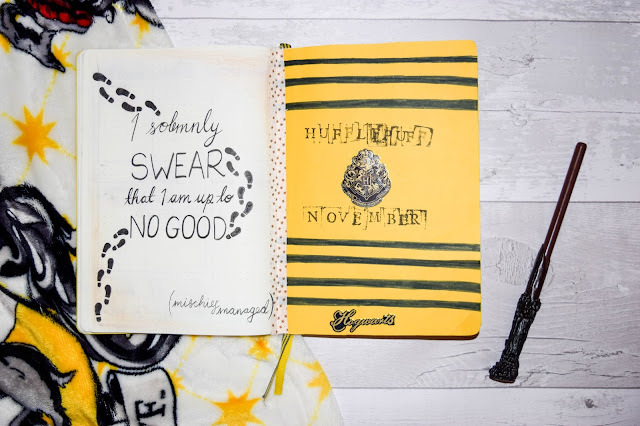 I originally had a different front cover but I royally messed that up so I covered it with yellow paper and decided to make the first page dedicated to my own Hogwarts House, Hufflepuff. 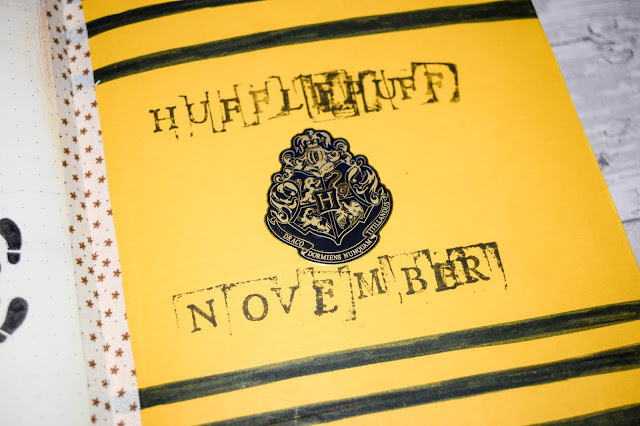 I used a set of stamps I bought from Tiger months and months ago and realised that the E is actually just another F. I'd bought them so long ago I wouldn't think they still have them so I just compromised and used an F and L together to make the E in Hufflepuff and November. I then added some black stripes in pen and the Hogwarts logo right in the middle. I do think it looks messy and isn't my favourite front page but it works and looks kind of Hogwarts-y. I also added one of the infamous Harry Potter quotes to the other side. I tried to make it look like that old paper but I think it just looks a little dirty now... Oh well! This month's overview looks pretty awesome to me. 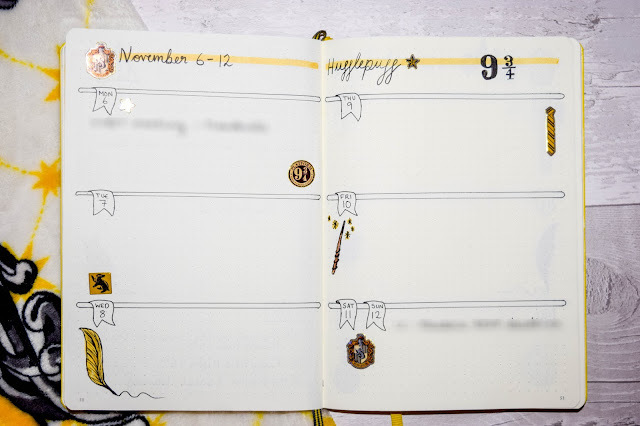 I didn't really use last month's because the layout didn't work for me but I liked elements of it, so I went back to a double page spread with space on the side and kept the key to keep track of things with a code. I put them in house colours too to keep with the theme! 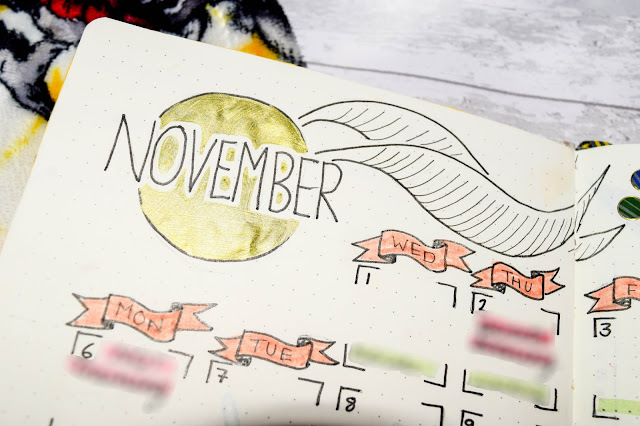 For the November logo on this page I went with the classic golden snitch behind the word and I think it looks lovely. I bought a gold pen especially for this part. Lastly, I had to use the sorting hat on this page and made it look like it'd sorted me into Hufflepuff... well. Because it did! 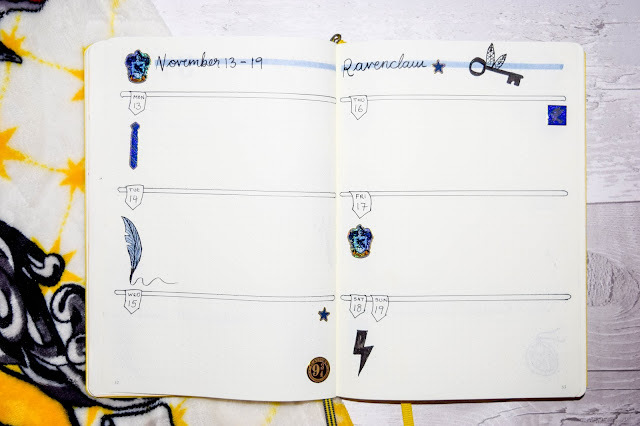 I really want to get into trackers and this month I have four, mostly inspired by Ana. I tried to keep these as realistic to what I do as possible too. 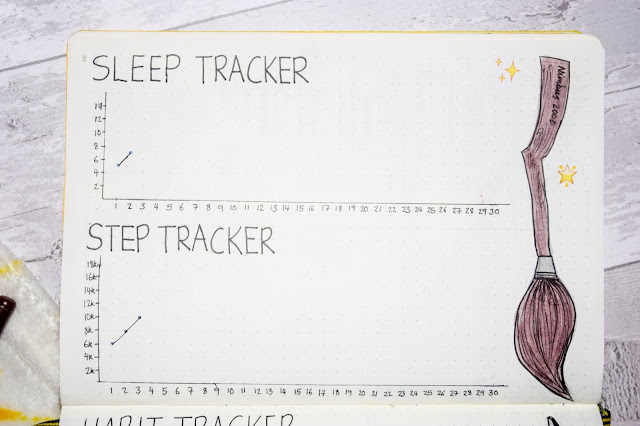 One is a sleep tracker to track my hours of sleep, one is a steps tracker that I will use my Fitbit to help me with. 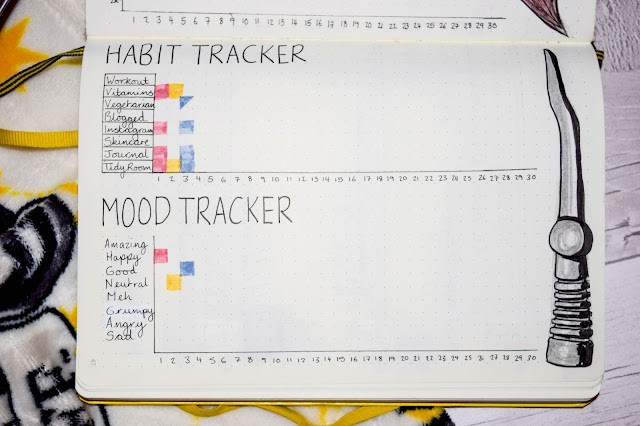 And the last two are a habit tracker and a mood tracker. 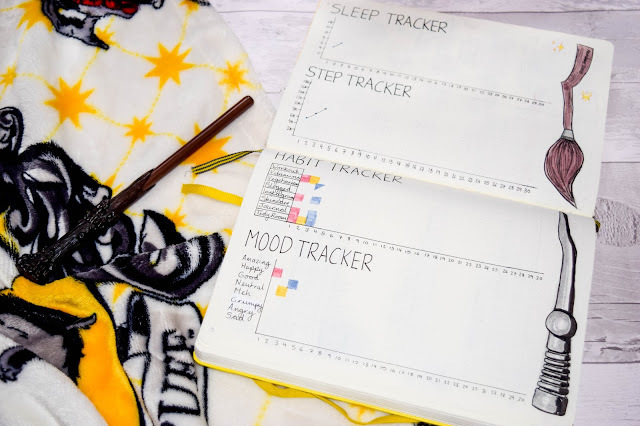 If I were to go back I'd probably do the mood tracker in a line graph style. 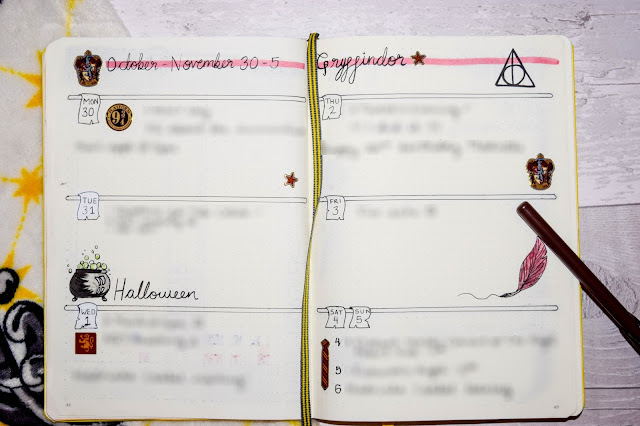 I drew a Nimbus 2000 and my wand from Pottermore too to keep it personal and fun! These were the pages I were most excited to make! 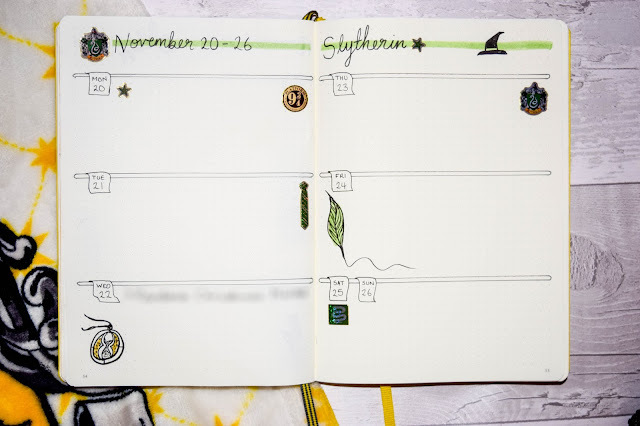 The idea of the Hogwarts House theme came from the idea that I'd be able to make double spreads for each week dedicated to a house. And with four full weeks in November to make, this worked out perfectly! I love the way they turned out and I tried to make them all different. The difference with this spread was also because I didn't like or use last month's much and I much prefer one like this. To keep things nice and even I added Saturday and Sunday together. But looking back I do wish I split it in half and added the banner in on the other side of the line, but it looks good as it is. Next month's theme is going to be Winter Wonderland for Christmas and colder weathers! I'm really excited for it already but I'm really enjoying this month already and I've already started filling up my journal with memories and using it to organise my life because I cannot organise myself without a diary!